A numerical model for finite thin plates with general properties (including anisotropic, inhomogeneous, profiled plates) and arbitrary (also dissipative) boundary conditions. An analytical model for finite, homogeneous, anisotropic plates with dissipative boundary conditions. An analytical model for infinite, periodic, profiled plates. The coupled system of equations is solved. A full populated matrix has to be inverted. u and p are computed simultaneously in one step. Structure vibration and sound radiation are separately treated. u and p are successively improved from an initial guess. where K is the stiffness matrix, M the mass matrix and F the external force. where Z(1) and Z(2) are the radiation impedances, v is the nornal velocity of the plate and Pbp is the "blocked-pressure", i.e. 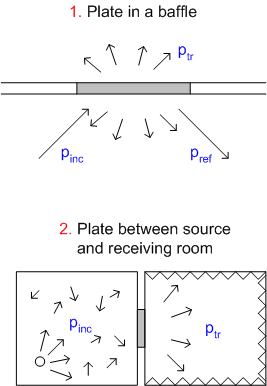 the pressure due to a sound source acting on a rigid plate.